Jackass #4 – The Guy who Invented the “Chirping” Smoke Detector. 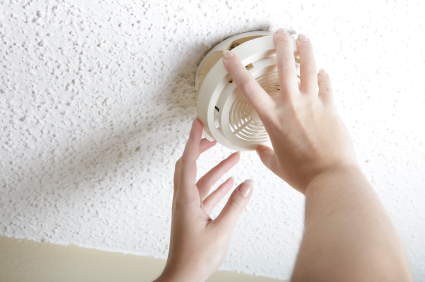 Chirping smoke detector – no so good! Smoke detector chirping at 2:00 AM? Not good at all! This solution includes a bit of jackassery. The high pitch chirp, it turns out, is a bit non-directional making it very hard to zero in on which smoke detector the chirp is coming from. When you add to that the chirp occurs for less than a second every several minutes, you have a device that can lead to an emotional breakdown especially if the chirps begin in the middle of the night. That’s because the jackassery doesn’t end there with occasional non-directional chirps. Once you finally find your chirping detector, you then have to figure out, most likely while perched on a ladder at 3:00 AM, how to disconnect the thing and where to put the battery. Assuming you have a 9V battery, you’re not through the woods yet. After you disconnect the smoke detector from the ceiling, if you’re lucky as I was, you’ll first have to locate a micro screwdriver to open the battery compartment. Can somebody explain to me why all the security for a 9-volt battery on an $15 smoke detector? Assuming you get that far, you’ll then have to screw it back into the wall. Replacing the smoke detector is harder than it sounds at 3:00 AM when accompanied with boiling blood. So after you put the ladder away and head back to bed be very careful as you are likely to hear another one start to chirp soon afterward. Batteries usually go dead around the same time. If you are willing to spend $200 on a smoke detector, this whole experience can now be avoided, forever, with the new Nest.